Shifts are long and varying, and facilities are often inadequate for transit employees to truly recharge and stay sharp on the job. But it doesn’t have to be that way. The quality of the environment within facilities can be designed to support shift workers and those with jobs that don’t follow traditional 9-to-5 schedules. For this next installment in our well-being series, RNL’s Lighting Design team recommends two key elements that can be utilized to support vehicle operator health; creating spaces with adaptability for varied activities and quality lighting that supports the adaptability of the space. Consider specific spaces that are used for mental and physical breaks within a facility. As mentioned in our previous article, different people recharge in different ways. However, most transit facilities don’t have the resources to have multiple break rooms that cater to different needs and preferences. Instead, consider larger break rooms that are adaptable, enabling employees to choose between quiet or louder more sociable zones. Elements such as light, colors, noise and furnishings can directly affect the way a space feels and thus how it is used. A key component of adaptability is making a space appear dynamic — changing over time fast enough for it to be energizing, but slow enough for it not to be a distraction. Sound intimidating? It’s actually fairly intuitive… and natural. One of the best ways to make a space dynamic throughout the day is to use natural daylight (while controlling for glare or excess summer heat gain). This allows for connectivity to nature with shifting patterns of light and shade, highlighting textures in the space. Adaptability can be enhanced by breaking spaces into different zones, by daylight (e.g. north-facing versus south-facing, perimeter zones versus interior zones) and/or variable electric lighting controls (e.g. dimmable lights that are controlled by occupants or daylight sensing photo-sensor). This allows operators to choose the light levels that suit their needs or tasks. Spaces with low light levels can be more soothing and relaxing, while spaces with high light levels can be more energizing and focused. 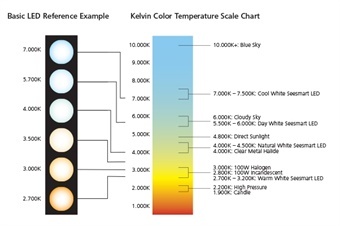 Quality of Light – Is there such a thing? A growing body of research points to connections between the disruption of the human circadian system, responsible for regulating our sleep/wake cycle, and illnesses ranging from clinical depression to cancer. One of the primary activators of our circadian system is light. Our bodies need variations in the intensity and quality of light throughout the day. Essentially, our natural human cycle wants us to live like cavemen with high levels of bright white light during the daytime (like the sun), low levels of warm light during the evening hours (like firelight) before bed and total darkness for quality sleep (like you are in a cave). So what can a transit agency do to support a healthier work environment for employees working all hours of the day and night? First, consider the quality of both natural and artificial light in spaces that are regularly occupied. Spaces filled with daylight to the point that little or no artificial lighting is needed are best, provided attention is paid to minimizing glare or excess heat gain in summer. This works for the daytime shift, but how about when the sun goes down, or hasn’t even risen yet? For those operators who work the second or third shift, flexible electric lighting systems that vary the color spectrum and intensity of electric light throughout the 24-hour cycle are key. Within reasonable limits of safety, spaces with lower light levels, lower mounting locations (i.e. table lamps instead of overhead lighting) and warmer color temperatures are best for workers coming off their shift towards the end of the natural day, signaling to the body that it is approaching time for sleep. At the same time, spaces with higher light levels and cooler light temperatures should be provided for operators who are starting their shift and need to stay alert. While this does not support the natural circadian cycle, it is a matter of personal safety and therefore must be supported. Zoned control based on activity and tasks will allow for control of lower and brighter light levels when and where needed. 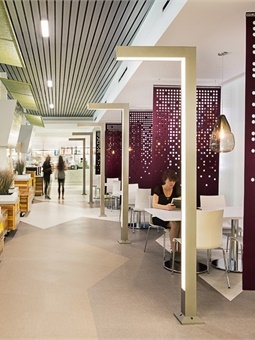 There is still much research to be done, but the types of spaces and the quality of lighting within them can contribute to a healthier work environment. Balancing daylight with cost-ffective lighting controls, activity-specific zoning, and adjustable color temperatures can help support the well-being of shift workers and create a more comfortable and interesting work and break environment. This article was written by Rachel Bannon-Godfrey, director of sustainability at RNL and Katherine Stekr, Lighting Designer for RNL, a national architectural firm specializing in the planning and design of bus and rail operations and maintenance facilities.